A new survey has revealed that nearly three quarters of car drivers have no idea what the right speed limit is for driving on single carriageway roads. According to the survey of 1,000 drivers by HPI, only 28% of drivers know the correct speed limit – 60mph; alas, 43% of drivers think the correct speed limit is 70mph while 29% believe it is 50mph. There is some good news though. While nearly three quarters of UK motorists don’t know the speed limit, the majority of Theory Test Pro users do. In our Facebook poll, out of the 670 votes cast, 84% of you knew 60mph is the correct speed limit for a single carriageway road. That’s well over three quarters of you, the opposite to the average UK driver – so give yourselves a pat on the back. There is a problem however – it means that 16% of you didn’t know, instead believing the speed limit to be 70mph. Such a knowledge gap could see you unwittingly breaking the law and being done for speeding. This would mean three points on your licence, a £100 fine and a probable hike in cost to your already expensive insurance premiums too. To make sure that you know your speed limits inside and out, here’s a quick guide to what the speed limits are for car drivers. We’re hoping the next time we run the speed limit poll, we’ll have 100% of you knowing the right limit. For built-up areas, the speed limit is 30mph. For single carriageways, most of you clearly know that the limit is 60mph while dual carriageways and motorways are 70mph. 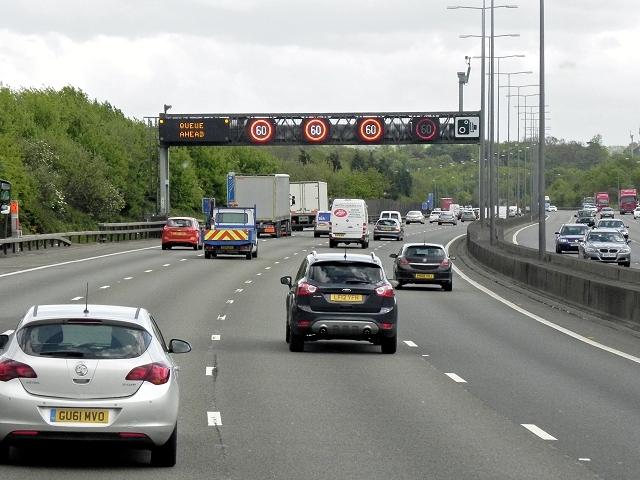 Variable speed limits are also popping up on ‘smart’ motorways all over Britain – check out our blog post here for full details – and display the speed limit on electronic signs on the motorway’s overhead gantries. While the top speed remains 70mph, the speed limit can be reduced ‘on the fly’ to aid in traffic flow during congestion, roadworks or if there has been an incident. Bear in mind there are two types of speed limit – fixed speed limits and national speed limits. Fixed speed limits are typically identified by a number within a red circle – these will contain either 20, 30, 40 or 50mph. Such limits are usually displayed when entering a speed limited area; think when driving into an urban area for example. National speed limits are shown as a circular white sign with a single dark stripe running diagonally through it. Oh, and don’t forget the lesser-spotted minimum speed limit – while rare, these can be found in high risk locations such as tunnels and are circular blue signs with the minimum speed displayed in it. You’ll know when the minimum speed limit ends as the same sign will be displayed but with a red line through it. I highly recommend theory test pro. I’m an ADI and used it myself and recommend it to all my students. Brilliant app.